When Lending Club launched in 2007 there was no trading platform. There was no way to sell notes; once you invested in a loan you had to hold that note to maturity. But then came the Lending Club quiet period in 2008. When they reopened in October 2008 after they had completed their SEC registration there were several changes to their platform. The investor notes were now considered securities, in a similar way that common stock is considered a security, so they could now be traded on a secondary market. Lending Club chose FOLIOfn to manage their trading platform. This is the same company that manages Prosper’s trading platform but the program is run separately and you need to open up separate accounts on FOLIOfn for each platform. It is a very simple process to sign up for a trading account, it only takes a couple of minutes. Once signed up every time you click on the Trading Account link from your Lending Club account you will be taken to your FOLIOfn account. At Lending Club the trading platform brings a way for investors in most states to invest with p2p lending. Lending Club operates for retail p2p investors in just 28 states but with the trading platform many more states are opened up. Only residents of the District of Columbia, Kansas, Maryland, Ohio, Oregon, and Vermont are ineligible for investing on the trading platform. What the trading platform brought to Lending Club and p2p lending in general was liquidity. It provided a way for investors to liquidate their entire portfolio if needed. If an investor finds themselves in a bind and needing their money back as soon as possible they can sell their notes. As long as they are willing to sell their notes at a discount then they can liquidate an entire portfolio in just a few days. You may decide to liquidate just a portion of your portfolio. 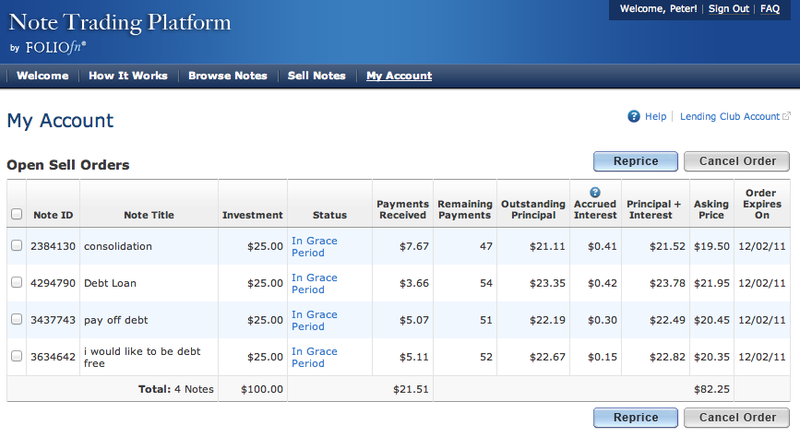 For several months now I have been focusing my new investments on loan grades D-G. But I have many A- and B-grade loans in my portfolio that were part of my initial investment strategy. I have slowly been liquidating some of these loans and using the proceeds to invest in loans that pay a higher interest rate. So when your strategy changes the trading platform provides an efficient way to offload loans that no longer meet that strategy. Some investors use the Lending Club trading platform as a vehicle to sell the late loans in their portfolio. You can put a loan up for sale on the trading platform as soon as it goes into In Grace Period. Now, many notes that go into In Grace Period go current again so many investors ride it out. Some wait until a loan is 16 days past due and then put it up for sale. Either way, to sell a note that is late you will most likely need to price it at a discount. Now, you don’t have to wait for a loan to go late before selling it on the trading platform. It is sometimes possible to anticipate loans that may go late. I know some investors who monitor the credit score of their borrowers and when they see a downward trend in credit score then they put the loan up for sale on FOLIOfn. When you click on the Sell Notes link on Folio you are given a list of all the notes in your portfolio. 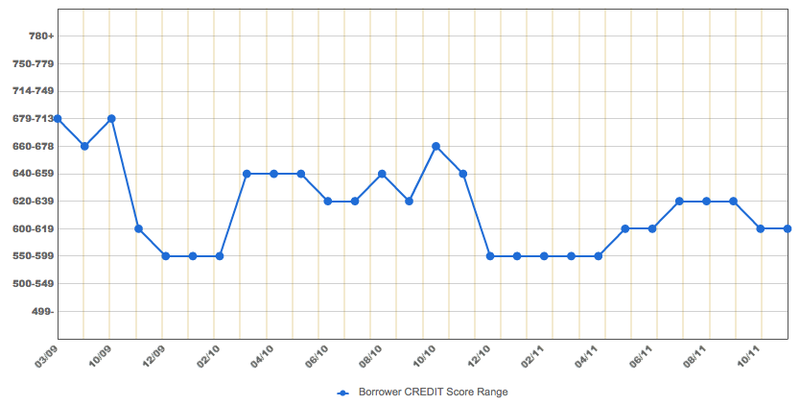 You will see a Credit Score Change column that indicates whether the borrower score has gone up, down or is unchanged. When you click on the note (by clicking on the link in the status column) you are provided with more detail about this note. Below is a chart showing one of my notes that is over two years old. They have paid on time every month but their credit score has fluctuated from 679-713 (where it was when the loan was issued) all the way down to 550-599. Some investors might have sold this loan when the score dropped that much but this borrower has remained current during the entire life of the loan. Some investors will price their notes at a large premium over their par value in the hope that an unsophisticated investor may buy the note. Since this change the 70% cap has at least removed from the platform those notes that were priced at ridiculous levels – sometimes several thousand percent above their par value. But their are still many notes on the trading platform that trade for an unreasonably high markup. I see many notes that are put up for sale for a 5% premium even before any payments have been made – and even late loans are sometimes listed for a small premium. It is very unlikely that any investor would buy such notes. This is the big issue for most investors. I spoke with several people about this topic and there was a wide variety of opinions. But most people said that the market is inconsistent and that some days you can sell a current note at a small premium and other times it will not sell at all. Before we can price a loan for sale we need to understand the concept of par value. When you put a note up for sale Lending Club will tell you the par value of that note. This number is the total amount of principal left plus any accrued interest for the current month. You can then chose to go above or below that par value when setting the price for your note. Here is what I have found in my research. Notes that are current can sell for a 1% – 2% premium as long as there is not a rapidly declining credit score. Notes with an increasing credit score and a good payment history are easy to sell for a small premium but once you price it at more than 2% over par you reduce the pool of willing buyers. Notes that are In Grace Period can sell for a 5-10% discount as long as they have a decent payment history. Notes that are 16-30 days past due need at least a 25% discount to sell. Seriously past due loans may not sell at all regardless of discount but I have sold a couple of 30-60 day past due loans for a 50% discount. Keep in mind that FOLIOfn takes a 1% cut of the sale, so to break even on a loan you need to price it at a 1% premium. Active note traders should check out the Lending Club Experience blog. Marc is a relatively new investor who is an active trader. He is in a state that does not allow investors on the retail platform but that hasn’t stopped him from getting excellent returns, at least so far. When I reached out to him while researching this article he responded in great detail which he made into this blog post. One of the reasons that the Lending Club trading platform is so vibrant is that there are a large number of investors who can only invest in p2p lending by using the trading platform. This means there is a large and willing market of buyers of notes. If investors are looking for a similar interface to the one that is available on the retail platform they will be sorely disappointed. It is a completely different interface and one that is not very user friendly. It lacks polish and it is not easy to wade through the thousands of notes for sale. And there is one feature that is downright misleading. There are seven check boxes for the average interest rate in the Browse Notes screen. But these check boxes do not refer to interest rates at all – they actually refer to the Lending Club loan grades. For example, if you click on the 14% average rate – you will get notes that range in interest rate from 15.95% to 20.3% (as of this writing). You will not actually get ANY loans at 14%. This is because this selection does not refer to interest rates at all, it refers to loan grade. By clicking the 14% box you are actually selecting all E-grade loans which can vary in interest rate quite a bit. I am not sure why Lending Club hasn’t changed this, it is very misleading for investors. On the Lending Club retail platform you can filter the available loans by dozens of different criteria. On the trading platform that is not the case. You can filter loans by just three criteria: average interest rate, payment status of the loan and the number of remaining payments. There is no way to choose loans based on credit criteria such as number of inquiries, number of delinquencies, public records, etc. To see whether a loan might meet your criteria you need to click on the loan and then click on the small original listing link at the top right of the screen. There is one more tool, thankfully, that can help investors. You can click on any of the columns and sort the data in ascending or descending order. So, you can browse the notes in order of their markup or discount, that is something that many buyers find very useful. I know of at least four investors who don’t rely on the trading platform interface at all to do their investing. They are obviously very IT-savvy and they have developed their own tools to go in and scrape the data from FOLIOfn and then filter all the loans based on their own algorithms. Unfortunately none of these investors have made their handiwork commercially available but if you are a programmer then you can likely create a tool to help you invest. Now, not many of us can program a script to scrape the data from the trading platform so we are left with using the main interface. Here are the steps I recommend investors use when making an investment. Choose your filters – you only have three choices but choose your average interest rate, payment status and number of remaining payments. If I am buying notes I like to see notes that have had a few on time payments and have never been late. By choosing the status of “Never Late” and 54 or less remaining payments you filter out about two-thirds of the loans on the platform. Sort by Markup/Discount – This will bring to the top the notes with the largest discounts. Look at Credit Score Change – You don’t want to overpay for a declining credit score. It could signal some payment problems ahead. Look at Yield to Maturity (YTM) – If you are looking to pick up a bargain this number should always be greater than the stated interest rate. If YTM is 15% and the interest rate is 20% then you are paying a premium for that particular note. That may be ok if there is an on time payment history and an increase in credit score but if not you are likely overpaying for the note. Of course, you could decide to venture in to the late loans in the hope of picking up a bargain but that is something I can’t recommend. If you get lucky you can get great returns by doing this but it is a gamble. What about others? I know there are many investors out there who have a lot more experience on the trading platform than I do. Please add your words of wisdom in the comments. Later this week I will be reviewing the Prosper trading platform. Good article. A lot of people don’t understand the concept of par value. @Charlie, Thanks. I only explained it briefly but the article was already so long I didn’t want to go into more detail. As it is I know I left out some other details as well. If you held that note to maturity, you’d be paying that 1% to LC. You might want to clarify that “you need to price it at a 1% premium to the amount you paid for the note.” An unsophisticated investor might think the 1% premium is to par value, but if you purchased the note at a discount or premium, you need to sell it at 1% above what you paid in order to break even. Marc at Lending Club Experience also takes advantage of the math behind annualized return. The shorter you hold a note, the less money you need to make on every transaction to make huge annualized returns. He sells his notes on average around 14 days and sells between 1% and 2% premium to what he paid. It may only be nickels and dimes, so he has created tools to churn through a lot of notes. Personally, I think it’s slightly better to sell a note at say 18 months for a small premium than to hold it to maturity. It trades what would be interest income taxed at my 28% rate for long term capital gains at 15%. There is no good way to get the data out of the Folio platform for analysis. I then import these into a database table that I can then run analysis on, but it’s annoying to say the lest to do. It would be great if the Folio data was made available as an export because as it is now, there is no clean way to get the data out of the secondary market. If there is a general interest I could make a screen cast on how to do this. It is a pain though I must warn. Michael – Any update on this? Every time I want to place a big order I’ve been copy/pasting about 3,000 notes into Excel to run regressions, but it’s time consuming and painful. Let me know if you figured out a way to make it easier. Quite a bit has changed in the nearly three years since this post was written. But I am not an active folio trader. If you pose this question at the Lend Academy forum you will get an answer quickly. There are many people there who have developed their own sophisticated tool for trading on Folio. What Marc at Lending Club Experience is doing is being somewhat of a market maker of sorts based on his churn volume. @Lou, That is a good point. If you are trying to sell a loan that you had previously purchased on Folio then the par value is what you paid for it, not what Lending Club tells you it is. I also take your point about selling 18 month old notes. I put an A-rated note up for sale yesterday that was close to two years old and it sold within 24 hours. I am surprised because there this person paid a 2% premium for this note which really cut into the return they will receive (there was only $0.70 in interest left of the note and they paid me about $0.20 of that). @Michael, Thanks for sharing this info for the more technically savvy investors. I certainly can’t follow exactly what you are talking about. @Charlie, I don’t think Marc has a big enough portfolio yet (he said a couple of weeks ago he has less than 400 notes) to really be considered a market maker but if he keeps adding to his investments he could well be one day. @Lou, slight clarification. The notes that I sell, I sell on average after 14 days. By best return on notes have been sold under 4 days after buying them (barring an occasional 5 or 6 day and the rare 13 day and 24 day holds). However, of the notes I currently hold, I’ve held them on average for about 40 days. These are the notes I’d rather keep (in general). I sell the less favorable notes at a lower premium and my favorites I offer at twice the premium. @Michael, the annoying part is that you have to have the login cookies to get that URL to work (or use a browser tool like you mentioned). I just have my script query the browser as to what is being shown in each tab. So it kind of watches me browse Folio (and Lending Club) and keeps track of it for me. I guess a browser extension might be in order to make it easier to do. It could take advantage of your URL trick and watch the pages being browsed to collect what notes are held, etc. Just an idea. @Charlie and @Peter, I’m pretty close to having held 400 notes at some point in the last four months. I don’t think it’s an overall market mover, but I have seen some of my one day cash infusions affect the 120 highest Yield To Maturity notes. However, my day to day affect on the market is pretty negligible. @Marc are you doing this in an IRA account? Are you at all concerned with a tax nightmare at the end of the year? This is why I tend to avoid the secondary market until I know how LC reports gains on it. @Marc, Thanks for chiming in. I know you have a strategy that many of your fellow investors find very interesting. @Michael, I believe you will get a 1098 from Folio showing all your activity on the platform. I haven’t seen one yet but I imagine it will have some totals so Marc will not have to figure out the gain individually on every loan he sells. @Michael, Foliofn will file a 1099-B – Proceeds from Broker and they only include the amount of sales. But you do not need to calculate each note separately, I calculate the trading platform profits by calculating, account total – accrued interest – interest = profit. Any interest in doing a guest blog post? I definitely want to document the heck out of how to handle taxes with P2P lending. 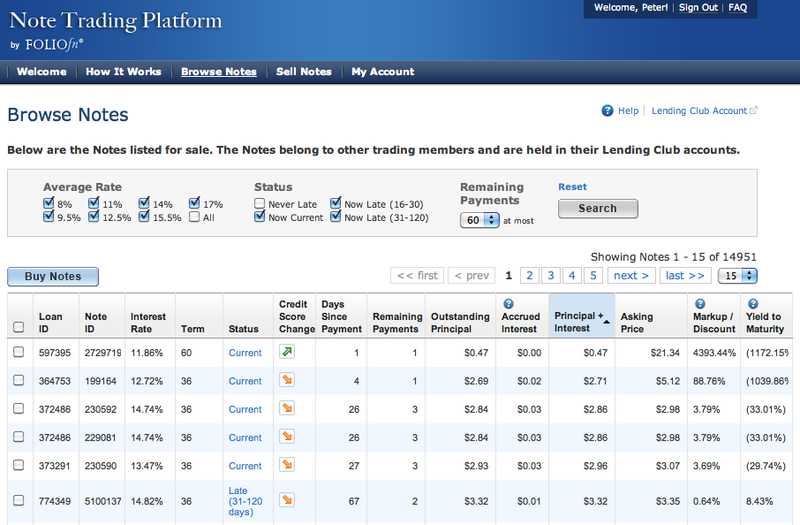 I’ve been working on some enhancements to the Lending Club & FolioFn websites using the Greasemonkey add-on for Firefox. (If you’re not familiar with Greasemonkey it’s a way for users to customize websites.) It started off with a way for me to add little comments to loans (e.g. “good” or “bad”) but now it adds colors and highlighting and a few other features. It’s a bit of a hackjob and is sure to break if they ever change their website, but I’ve found it pretty helpful. @Emery, I installed your script and I can see the notes/comments section but I don’t see any color changes. But this is the kind of thing that could make Folio much more useful. Although what I really want is for someone to create a script that can scrape all the data from Folio and then scrape the credit info from each listing – you would have to go into each note and then into the Original Listing link. Such a script would take a long time to run I would expect with 15,000+ notes on the platform but that is what I think would make Folio much more useful. @Peter, What browser and platform are you using? I know LendingClub added a “captcha” to their Account Activity page a while back. And the “In Funding Loan Data” on the Download Statistics page is only updated once or twice a day. Were these simple requests placing too much load on their system? That’s hard to imagine, but what other explanation can there be? @Emery, I am using a Mac running Firefox 3.6.24. That is an old version of Firefox I know but I mostly use Chrome. I have had discussions with Lending Club about automation and they are really don’t want people running programs to scrape their data. They know some people do it but they don’t want to encourage that kind of thing. They run a huge number of transactions a day and they don’t have the server firepower of a Fortune 500 company. @Peter, I made a change to the script which should make it more compatible with your browser. If you have a moment, perhaps you could try installing it again? Thanks. @Michael, I was thinking that this year when preparing taxes I’ll create an Excel spreadsheet with the calculations needed, I can send it to you and I’m sure you’ll be able to improve it with macros or create a program. Then you will only need to post this file or program with a basic explanation and instructions how to use it. Interesting. I’d like to see how that could be worked into a web app for sure. I’ve been using the secondary market in a limited manner, and I was wondering about notes being purchased when the payment is processing. Who gets that payment? Does the seller get it even if the note is sold before the processing is finalized; does the buyer get it, or is it somehow dependent on where it is in the processing as to who gets it? Can’t seem to find a clear answer. I think what happens is if a payment comes in the transaction is simply cancelled. It’ll show up in your Canceled Sell or Buy Orders as something like “Canceled, Loan PAYMENT”. Afterwards the note automatically goes back up for sale, I believe at the original price (i.e. unadjusted for the payment). It would be nice if they did it more like a stock with a dividend, but that’s probably a lot more complicated. So basically, if go to buy a loan that’s “In Processing…” (again, whatever THAT means) then you’re taking the risk that either: the payment comes in and cancels the transaction, or the payment is late. Neither of which are probably what you want.